As the bicentennial of the nation’s founding, 1976 was a time of major celebrations in America. For both 1975 and 1976, the DCI World Championship went to Philadelphia, “The Birthplace of American Democracy.” The events were held at the University of Pennsylvania’s Franklin Field, built in 1895 and still the oldest operating football stadium in America. The 1976 Blue Devils made history as the youngest corps to win the DCI title. The Devils held off the second-place Madison Scouts by two points, the defending champions having dumped their entire funk show mid-season in order to bring back all but the opener from their 1975 production. In 1976, the Blue Stars slipped to ninth place after placing fifth in 1975. Repeating a visual theme from 1975, the corps used the American Revolution Bicentennial emblazoned on their timpani and the color guard flags. The show opened with a medley of John Williams’ musical score for the smash blockbuster hit, “Jaws.” Steven Spielberg based his 1975 film on a 1974 novel by Peter Benchley. The success of “Jaws” and its Academy Award-winning soundtrack propelled Williams to international acclaim, and Spielberg utilized his musical talents for a large number of commercially successful films, including “Close Encounters of the Third Kind,” “E.T.,” and all the Indiana Jones franchise. The first shows of the Blue Stars’ season started with the two repetitive-and-famous “here comes the shark” notes that are synonymous with the film, but those soon disappeared. For the remainder of the season, the production opened with the soundtrack’s “Out to Sea” segment, arranged as a dynamic march not at all as delicate as in the film score. The second part of “Out to Sea” was more tranquil. The color guard flags sequentially floated up and down to represent the waves of the open ocean. Music from the segment titled “One Barrel Chase” was also utilized. At an early June performance at the Cavaliers’ home show in Park Ridge, Illinois, the corps was in the middle of “Jaws” when a tremendous deluge opened up and everyone had to run to seek cover. The contest had to be cancelled when the downpour wouldn’t let up, resulting in mass flooding throughout the Chicagoland area that closed some expressways. When the sudden storm unleashed itself over the stadium, the audience ran in panic to get away from the torrential rain. The joke at the time was everyone was running to get away from the shark. “O Bless the Lord, My Soul” from Stephen Schwartz’s 1971 musical “Godspell” was next. The 23-year-old Schwartz based the musical on a book by playwright John-Michael Tebelak that served as Tebelak’s master’s thesis, a musical expression of parables mostly from the Gospel of Matthew. The production and its two Grammy Awards jump-started Schwartz’s career, leading him to work with Leonard Bernstein as a lyricist for “Mass,” to write the songs for the musical, “Pippin,” and to become a composer for films such as “Prince of Egypt,” culminating with him penning the music and lyrics for the smash hit, “Wicked.” An extended percussion feature led into the main melody of the song that was played by the full corps. During the drum feature, it was easy to note that the tenor and bass drums were all made with see-through acrylic shells. This was a product put out by Ludwig Drum Co., known as Vistalite. 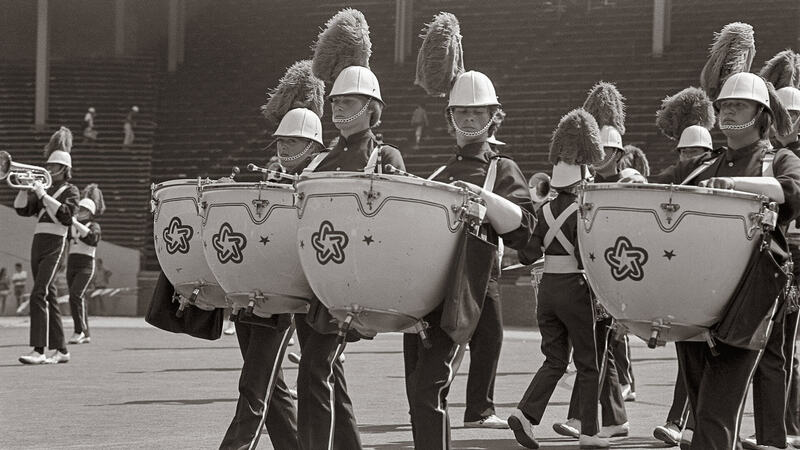 The drums didn’t last on the market for too many years as they scratched easily, especially under the rigors of drum corps use, and tended to sound more “tubby” than the warm resonance delivered by wooden-shelled drums. The corps’ concert standstill production was a combination of Chuck Mangione’s “Echano” and Ernesto Lucuona’s “Malegueña.” Mangione, a flugelhorn player and composer, was big with drum corps in the mid-1970s. 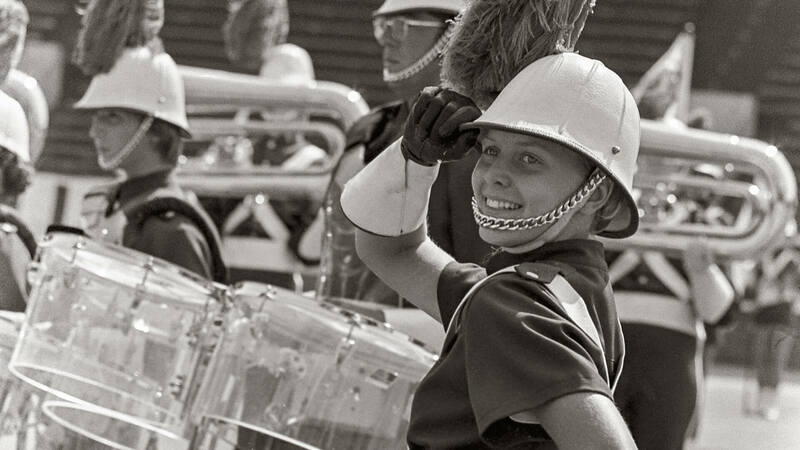 Among other DCI finalist corps that played his music between 1974 and 1977 were the Blue Devils, Oakland Crusaders, Bridgemen, Freelancers, North Star and Cadets. The standstill continued with “Malagueña,” written by Lecuona as the sixth and final movement to his 1928 “Andalucia Suite.” The famed Cuban pianist wrote 176 such pieces for piano, but also wrote scores for 11 feature films, including some for the largest Hollywood studios of the 1930s and 1940s. The version the Blue Stars utilized is the one best known to drum corps fans, the blazing rendition arranged in 1961 by Bill Holman for Stan Kenton’s “Adventures in Jazz” album. Next was Barry Devorzan’s “Theme from S.W.A.T.,” originally written for the 1975-1976 crime drama television show. Devorzan also wrote soundtracks to films such as “Dillinger,” “Private Benjamin,” and “Mr. Mom.” The song became more popular in a disco version performed by the American funk band Rhythm Heritage on their debut album, “Disco-Fied,” and it became the number one single in the U.S. during 1976. The sound of a siren was twice prominently presented during the corps’ rendition. A drum break not related to the following selection led into Mangione’s “Bellavia,” translated as “beautiful way,” off the 1975 album of the same name. The song, written to honor his mother, won Mangione a Grammy Award for Best Instrumental Composition, his first such honor. At the climax, the corps pushed forward a drill formation in the shape of the corps’ star logo. The show closed with “Soulero,” by keyboard jazz musician Bob James and Richard Evans, off James’ “One” album of 1974. The album was an early entry in the smooth jazz genre. “Soulero” was inspired by Ravel’s “Bolero” and featured a similar repetitive rhythmic beat. The closing musical tag returned from the Blue Stars’ 1975 show and would come back for a third time at the end of the corps’ show in 1977. This week you can save on the Legacy Collection DVD that contains this complete Blue Stars performance, along with all finalists from the 1976 DCI World Championships. Buy the 1976 Legacy Collection DVD.